I have been seeing a few people suggest that Orly Rock Solid might be a dupe for the new OPI DS Titanium, so I decided to drag out my bottle of Rock Solid and check. Both polishes could be described as glitter in a dark grey jelly base, so I can see why people maybe thought they could be similar. 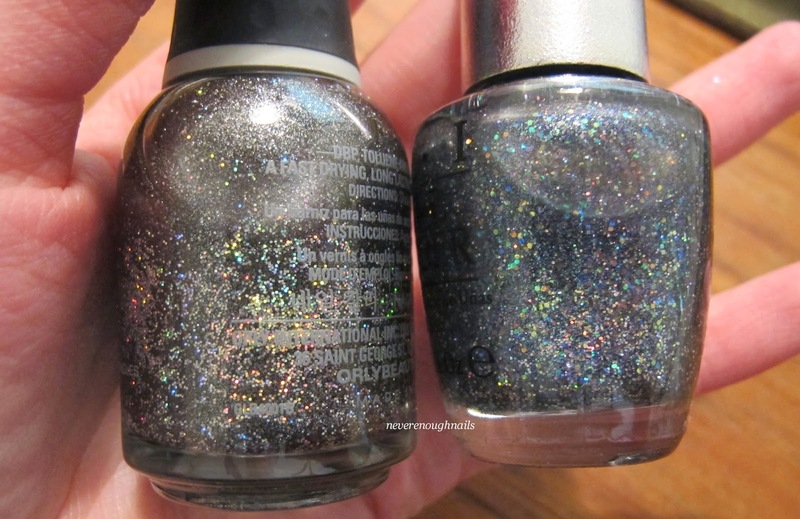 However, the glitters in these two polishes are totally different and even the colors of the grey bases are different. The picture above shows a bottle of Orly Rock Solid on the left and OPI DS Titanium on the right. You can see the differences right away in the bottles. These swatches show three coats of both polishes plus top coat. As you can see, the base of Rock Solid is darker, almost black, while the base of the OPI is a lighter, almost blue tinged grey. The glitter in Rock Solid is small round holo glitter, while the glitter in Titanium is iridescent, less regular looking in shape and more than one size. So ultimately, these are not even close to dupes. I guess they are slightly similar in concept, but different in execution. I personally love them both, with a slight preference for the OPI because i love that cool iridescent glitter! By the way, I am always happy to do comparisons between polishes. Please just leave a comment or shoot me an email if you have anything you'd like compared.